Ever have one of those nights when you just want to do mindless mind-games on your computer? Well, I guess that says something about me, doesn't it. On the other hand, if you're one of those people who are similarly afflicted with Internet Escapism-itis -- nobody else need ever know. Here's one site I tripped over while I was surfing the net tonite: Mental Floss. Under the tagline "Where Knowledge Junkies Get Their Fix", Mental Floss provides information about things you never knew you wanted to know. Mental Floss includes "Name All The Presidents In 8 Minutes". Well, no, I didn't take that one. I couldn't name all the presidents in eight years. But that page includes links to a lot of OTHER tests which I found more interesting. That means, I thought I knew something about the topic. Like, name the state by the license plate, and guess the state motto, and ... um ... some other stuff that I didn't do so well at. If you have read this far and NOT clicked on one of the Mental Floss links ... okay, go ahead and stand on your pride. I'm gonna put the link on the sidebar, too, under "Hot Link(s) of the Week". That way you can secretly click on the link in those wee small hours of the night. Nobody needs to know. I sure won't tell. Oh, and did I mention that Mental Floss is a magazine? And you can subscribe to it? Heck, you can even subscribe to a Digital version of the magazine for only $29.97, and get a free t-shirt, too. Just don't show up at the next match wearing the t-shirt. I'd be so embarrassed for you. Jerry, We WILL have a March match at Dundee. It's going to take a little shuffling, and a quick re-configure on a couple of stages in the middle of the match, but we will have six stages, 100-110 rounds, and do it all in three bays. That's the plan anyway. Bill, this is exceptional good news. Thank you for updating the news, and so quickly. I'm so glad to learn that Dundee is able to respond so promptly to adversity, and especially because the stages at that range are so consistantly ... inconsistent. That is to say, challenging and innovative. It may seem petty to assert that Evil Bill's influence on stage design and construction add spice to what might otherwise be a bland reincarnation of stages which we've all seen before, but the fact is that originality is the keyword at Dundee. Evil Bill (and Paul and Marty) see to be without peer in designing stages which are unlike any we've seen in club matches within the section. Yet even Section and Area (Level III?) matches fall short of the stages which we have learned to expect from Dundee matches. Not that I feel comfortable with Dundee stages; but I always feel challenged. Even when I don't perform to my own expectations, Dundee matches give me pause to reflect on the competitive talents which I have NOT developed fully. Besides that, they are fun to shoot! So I'm looking forward to the match next weekend. It may be dramatically constrained by the available range-space, but I know I will crash and burn on at least one or two of the stages. Just got a call from Jonathan U. Knudsen vineyards is logging to the property line behind the pistol bays. Evidently it has created a possibly unsafe condition, and effective immediately the pistol bays at Dundee are CLOSED. Doesn't sound like there is going to be an easy or quick fix to the problem, so for now I guess USPSA matches at Dundee are uncertain. We couldput on a 3 or maybe 4 stage match down in the hole, but that's about it until things get resolved up on top. Is it worth the effort to even do a shortmatch? I'll find out more at the members meeting on Saturday. Hopefully this will not be a permanent problem. For now, it sees clear that the March match at Dundee is not a happening thing. That is, of course, subject to change; Bill's suggestion that they could put in a few small stages "down in the hole" means (I assume) in the huge Rifle Range and in the small 'pit' near the bench rests overlooking the Rifle Range. The 'berm' there is over 50 feet high, and it might be relatively safe if people are not actively working in the immediate vicinity. I wonder if the logging operation is expected to continue over the weekends, and how long the process will continue. This is extremely short notice, and I'm personally disappointed; I was looking forward to shooting my first match there since last summer. For more information on the Dundee "Crocodile Dundee" range, see their website at the "Team Croc" website. WASHINGTON — Senator Mitch McConnell, the Republican leader, had a little political advice last week for President Obama and the Democrats: Don’t pass the president’s health care legislation because you would risk losing in the midterm elections. Mr. Obama laughed about it afterward. “I generally wouldn’t take advice about what’s good for Democrats” from Mr. McConnell, he told an audience in Pennsylvania. But he conceded that “that’s what members of Congress are hearing right now on the cable shows and in sort of the gossip columns in Washington.” He went on to argue that the issue should be what’s right, not the politics. But this is Washington and politics are never far from the surface, especially at a decisive moment like this. If the schedule being mapped last week holds – and Mr. Obama’s senior adviser, David Axelrod, said on Sunday that it would — the fate of the president’s health care plan should be decided within the week. “I believe we will have” the votes, Mr. Axelrod said on ABC’s “This Week,” though Republicans and even some Democrats have questioned whether the votes are there now. But the plan’s fate could depend on how a couple dozen Democratic congressmen answer the questions Mr. McConnell and Mr. Obama raised: Would passing health care devastate Democratic chances in the fall? Would rejecting it devastate a Democratic presidency? Mister Obama ... Tear Down This Wall! Oh yes, we've progressed as a civilization. We now have laws which forbid us to hate each other. More specifically ... we haven't quite got to the "Thought Crimes" as described in Orwellian literature. England, March 10, 2010: a five year old child (or here a ten-year-old boy, depending on the source and the incident) may/will be "reported", and an entry is made in his semi-permanent academic record because he called a school-mate a "gay boy" in the schoolyard. The boy was reported after he called a friend 'gay boy'. His parents fear the record of homophobic bullying will count against him throughout his school career and even into adulthood. ... blogged at turnerradionetwork.blogspot.com that the three judges of the Chicago-based 7th U.S. Circuit of Appeals should be “killed” for upholding a Chicago handgun ban in June. “Let me be the first to say this plainly: These judges deserve to be killed. Their blood will replenish the tree of liberty. A small price to pay to assure freedom for millions,” the 47-year-old blogger wrote. He also posted addresses, photos, maps and other identifying information about Chief Judge Frank Easterbrook and Judges Richard Posner and William Bauer. American Muslims are banned from helping U.S. soldiers deployed in Afghanistan, Iraq and other "Muslim lands," according to a shocking fatwa, or religious decree, recently issued by American-based Islamic jurists. One of the most respected Islamic law authorities in America has decreed it is "not permissible" for even Muslims who are citizens of America to send food or other aid to American troops serving in those Muslim countries. The Assembly of Muslim Jurists of America, or AMJA, ruled it is a "sin" to help the U.S. military in its multi-front war on terror. These are only three examples of "Hate Crimes" in the world today. A child -- even those hardly past toddler stage, and placed in school supposedly to help him learn social skills -- uses a socially unacceptable epithet in reference to a schoolmate, and must live with the consequences of that momentary laps for the rest of his academic life. A blogger not only excoriates members of the American Judiciary System for their legal decisions; not only encourages others to kill them; but even includes their photo, address, and personal information. And an "Islamic Jurist" (speaking under the umbrella of a national society of Islamic Jurists) states that ANY support of American Troops fighting overseas -- even to include " the sending of food ..." -- is a sin. Which of these three incidents are legitimately "Hate Crimes"? In America, the First Amendment of the Constitution of the United States protects public expression of personal opinion, no matter how hateful or how heinous, no matter how distasteful or how outrageous. The principle is that those expressions which are most unpopular (or even those which are most 'politically incorrect') are specifically protected. But if a little boy uses an epithet in England, is he protected? Apparently not. And if an American Blogger encourages others to kill judges, is he protected? Perhaps not. And if an American Muslim Jurist declares it a sin to support American troops overseas, is he protected? I don't know the answer.. The main stream media, and our governments, swing so rapidly from left to right that I have no idea how to interpret the information provided. Am I the only one who can't keep up with the difference between Right and Wrong? Two years ago I posted an article entitled Hot Gun! WOOOOOO-EEEeeeeeeee! Hot Gun! The subject was a demonstration at Blackwater where Todd Jarrett fired 1000 rounds as fast as he could through a brand new Para .45acp (using hardball ammo, mixed 8-round and ten-round magazines reloaded by his assistants). The upshot (sorry) of the exercise was that (a) the gun endured shooting an entire case of ammunition without a malfunction, and (b) ten minutes later, when it concluded, the pistol was literally too hot to handle. I've just discovered that the whole thing is available on You Tube, so it seems appropriate to provide the videos here. Note that toward the end, because the pistol was so overheated (and perhaps the shooter was overheated' as well) "normal mode of shooting" was victim of the exercise. Jarrett completed the test only by using his 'strong hand' to hold the pistol, and used the trigger-finger of his left hand the 'fan' the trigger. If it needs to be said, this is NOT something that we want to do. Only the consumate professionalism of this World Champion shooter kept the test on-track without violating any safety rules. Note for you at home: even the most experienced shooter can, in time, become so distracted by extraneous circumstances that he forgets to pay attention to the business of shooting. Under normal circumstances, when we 'mere mortals' allow ourselves to be distracted by the perceived need to carry on a conversation, the result can be that gun control is rendered secondary to the distraction. You may want to write that down. In the immortal words of Colonel Jeff Cooper: "Thus Endeth The Lesson". Here's a good example of what NOT to do! When I teach new Practical Pistol shooters, I make it a point that a stage starting the shooter "Facing Up-range" means: Turn, then draw. That's a common error, and an entirely unsafe situation, in Practical Shooting. I have seen Grand Masters violate this elementary safety rule, even after decades of experience. Here, we see a shooter who turns to move out of the second shooting position, and his body faces uprange. He is (as is proper) "Match Disqualified". Even though his pistol is pointed up in the air at the time. 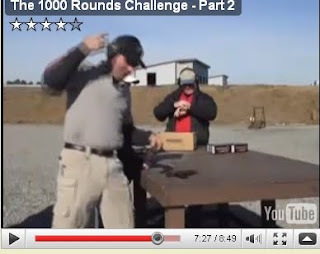 Rule of thumb: if your pistol is out of the holster, and you face up-range, you WILL be DQ'd. Don't do this at home, and for sure don't do this at a match.